Late last year at the NBAA Convention in Las Vegas, GE introduced its new turboprop, simply called (in GE’s current preference for brands over numerical designations) the Advanced Turboprop, and it did so with an air of understatement admirable in this age of the hype machine. Brad Mottier, the head of GE’s remarkably successful and sudden effort to establish itself as a big player in private aviation, made the detailed presentation almost casually, as though the announcement of a next-generation turboprop was just another day at the office instead of what it really was: a watershed announcement. At the press conference, nearly as casually, Textron Aviation’s Christi Tannahill was on hand to confirm that Textron would be the launch customer for the new engine, which it would use to power a brand-new product, a fast pressurized single-engine turboprop capable of carrying up to 12 at 280 knots and with a range of 1500 nm. Without question, one of the most important airplanes in modern personal air transportation is the Beechcraft King Air, an airplane that gave pilots and business travelers access to many thousands of small airports in communities not served by the airlines and far enough away from such larger air hubs that getting there and back was a major undertaking. The King Air, introduced in 1964 by Beech, was the outgrowth of the Queen Air, a curious name for an airplane, like an admission that Beech had something else in mind already. At the time of the birth of the King Air, the Queen Air was still an unpressurized craft, using the same Lycoming supercharged gas piston powerplants as the Twin Bonanza, on which it was based—it shared a common wing design, along with the engines, to go with its new tail section and fuselage. If the Queen Air was all about the larger, more comfortable and utilitarian cabin—early big Beech twins were popular with military customers, who ordered hundreds—the defining component of the even bigger King Air was the engine, the Pratt & Whitney PT-6 turboprop engine. The King Air was an immediate hit, and over the years Beechcraft, now along with Cessna a part of Textron Aviation, has built nearly 7,000 various model King Airs. Today it still produces. The concept of turbine power is ancient, in windmills and water mills, and the first encased steam turbines appeared in the mid-1800s. While both piston engines and turboprops spin a prop to provide thrust, the way they produce power is fundamentally different. For the uninitiated and in very simple terms, a turboprop engine utilizes a super-fast-spinning turbine to compress intake air to great density and temperature. When fuel is introduced it ignites and expands, spinning the power turbine, which spins a shaft to which the propeller is attached, providing the motive force for flight. Modern jet engines, known as “turbofans,” operate on the exact same principle; turboprops are sometimes referred to by the fanciful and accurate term “jet prop.” That’s really what it is. Compared to a turbine powerplant, a piston engine seems needlessly complicated. Ubiquitous the world around, piston engines make use of a number of metal can-like pistons contained in sleeves called cylinders. As part of a complex cycle, the pistons are moved up and down by the ignition of a fuel-air mixture within the cylinder, ultimately turning this up-and-down motion into the spinning of a prop shaft (along with the creation of a great deal of heat), just as a turboprop engine does, though with far greater mechanical complexity and with far less power produced for the weight involved. GE’s new advanced turboprop engine doesn’t yet have an official name, but the company’s goals for it are well known and lofty. Turboprops, in contrast, are elegant and far more reliable. They’re also more expensive to build, buy and operate than piston engines. The staying power of the turbofan is remarkable. While industry experts prophesized the death of the turboprop after small turbofans were introduced in the late 1960s, it never happened. More than ever, the turboprop has a place on light regional transportation aircraft that fly lower and somewhat slower than light jets, but while burning a third less fuel and typically using less runway, as well. The PT-6 wasn’t the first turboprop, far from it. 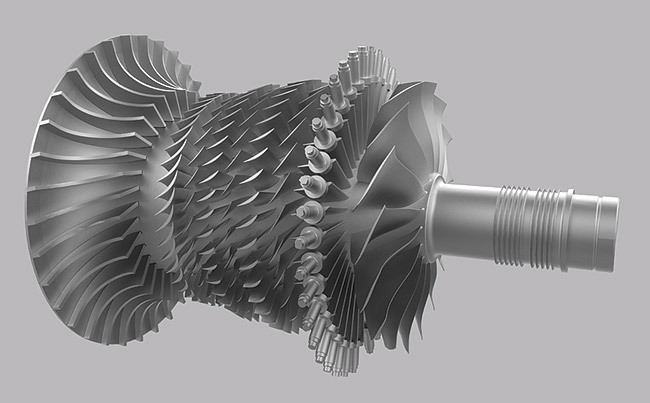 The concept of turbine power is ancient, and the first steam turbines appeared in the mid-1800s. The first aviation turbines were created in the late 1930s, and the first turboprop, an outgrowth of the jet engine and not the other way around, came about in the mid-1940s, a creation of British company Rolls-Royce. The PT-6 came about a decade later, and it took the aviation world by storm. To call the PT-6 an important product is a vast understatement: It can be credited with helping create the entire small turboprop segment that today includes a number of single-engine models, most pressurized, but with a couple of unpressurized models, most notably, the Cessna Caravan and Quest Kodiak, intended for flight mostly at non-oxygen altitudes. There are competitors to the PT-6 in this segment of personal and business transportation. 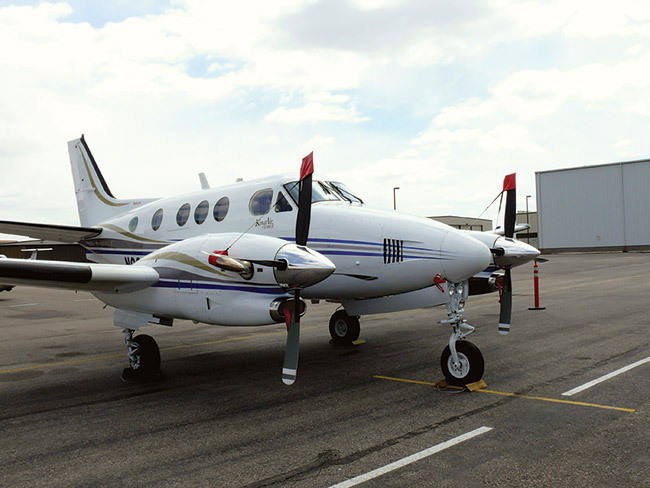 Honeywell’s TPE331, originally developed by Garrett AiResearch, powered a number of King Air competitors in the heady days of the 1970s and 1980s when the turboprop twin market was a crowded place. Turboprop twins from Aero Commander, Swearingen, Piper and Cessna made use of the Garrett engines, which were noted for their relative fuel efficiency. But turboprops were and are antiquated in some surprisingly user-unfriendly ways. Turboprops are universally manually controlled, which requires a lot of attention to gauges and a lot of fiddling with power settings, both of which distract pilots from the world outside the airplane. Conversely, modern turbofan engines, even those made by turboprop king Pratt & Whitney, feature what is known as full authority digital engine control (FADEC). This computerized control allows pilots to set power to a detent, “takeoff,” for example, and then concentrate on flying the airplane. In a turboprop the pilot needs to split their focus between monitoring the engine and flying the airplane. The monitoring part isn’t a pro forma exercise. Setting the engine power properly is critical in order to keep the engine from producing too much power (too little power can be bad, too) and therefore exceeding its operating limitations, known as “overtemping,” which can lead to catastrophic damage to the engine both in terms of cost and mechanical integrity. Turbofans with FADEC, which are all modern ones, also have greatly simplified start and shutdown procedures. The startup on most modern jets is simply a matter of pressing the “start” button, moving the thrust lever off the stop and watching to make sure the start sequence goes as expected. Even if it doesn’t, FADEC will automatically abort the start. The Pratt & Whitney Canada PT6A turboprop engine helped create an entire segment of general aviation, including the personally flown turboprop twin, best exemplified by the Beechcraft King Air series, especially the C90 model, shown in this photograph. Not so with turboprops. The start sequence is labor-intensive. Even at cruise, pilots will dig out performance charts and set power based on the air temperature, all of it related to the importance of getting best power out of the engine while keeping temperatures in the green. I’ve often asked why Pratt & Whitney Canada, which has built more than 40,000 PT-6 engines, hasn’t automated operation of this 50-plus-year-old engine. The technology exists to do it. The market would embrace it. Pilots are yearning for it. It would improve safety, reliability and efficiency. The best answer I can come up with is a question: When you’re the market leader, what incentive is there to invest in an upgrade to a product that outsells its competition by a wide margin and has been for decades? Pratt & Whitney will likely have to up its game if it wants to maintain its market share, as GE looks to capitalize on Pratt’s weaknesses with a number of design initiatives to position the Advanced Turboprop as a modern successor to the PT-6A. Seven years ago when GE purchased Walter Engines, a company headquartered in the Czech Republic that specialized in making a turboprop engine similar in output and design to the PT-6A, it seemed an unusual acquisition. After all, GE seemingly had all the business it could handle making giant engines for airliners, military aircraft and helicopters, so what did it want with this seemingly minor player in a market it hadn’t paid a lot of attention to previously? The first product GE began to develop was a smaller turboprop, the H80, based closely on an existing Walter design, but with improved manufacturing and design. GE earned certification for the 800 shp H80 in 2012. The Advanced Turboprop, on the other hand, is a more powerful engine, with a planned rating, for the first model, of 1300 shp. It will also be a clean-sheet design, of a sort. It borrows heavily, GE says (and this is a good thing) on some existing GE products. For one, it uses compressor technology from its wildly successful T700 turboshaft engine, which powers Sikorsky Black Hawk and Boeing Apache helicopters, among others. It makes use of aerodynamic modeling from GE’s commercial engines (aero modeling is critical for cooling and effective airflow over super-hot and fast-spinning components) and the turbine cooling technologies from GE’s successful Passport turbofan engine. 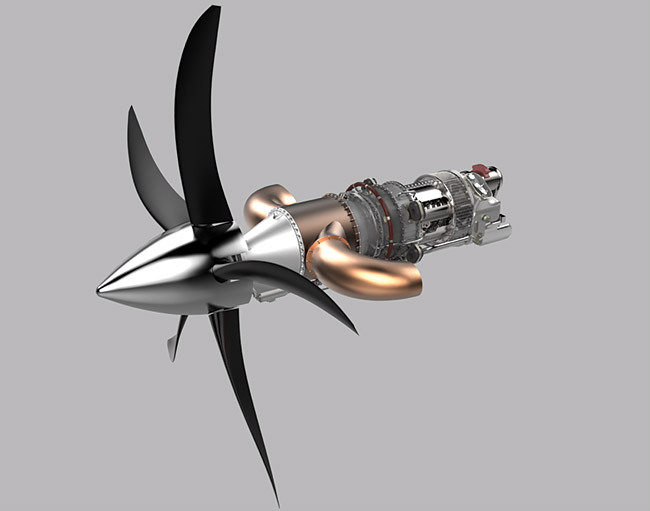 Not a true clean-sheet design, the advanced turboprop borrows from products GE developed for its commercial, military and GA next-gen engines. GE plans to produce the engine at a new turboprop center of excellence, to be located in Europe, it says. It will announce the precise location of the new center soon. At this point, more is known about the Advanced Turboprop than the Textron Aviation airplane it will power. The 1300 shp turboprop will feature, very importantly, an overall pressure ratio of 16:1, double that of competing designs, which will allow, Mottier said, a 10% improvement in power output at 20% less fuel burn. 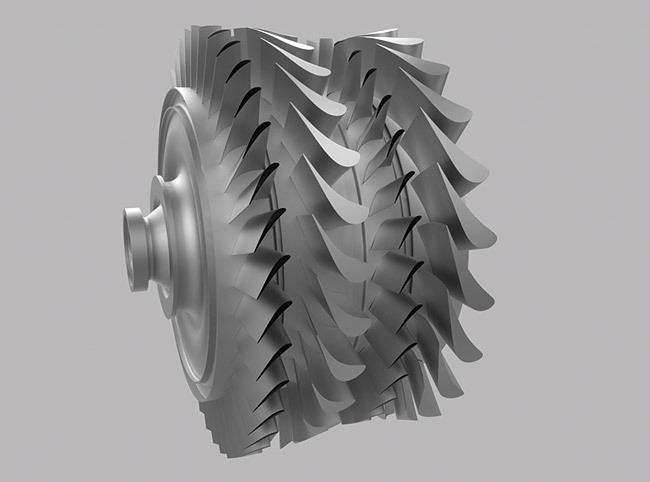 The high-pressure turbine will feature numerous GE-developed technologies, including single-crystal cooled blades with advanced 3D aerodynamic modeling, a process that is like a microscopic version of aerodynamic modeling on an aircraft’s flight surfaces. The better the air flows over the vanes of the turbine, and the more uniform its structure is, the better it performs and the cooler it stays, which means the pressure can increase while maintaining the same safety margins. 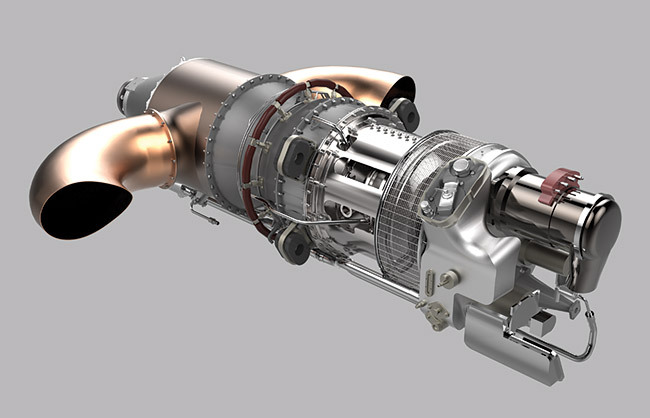 The high-pressure turbine will feature numerous GE-developed technologies, including single-crystal, cooled blades with 3D aero modeling. Mottier expects overhaul intervals to increase by as much as 33% over time, which can allow owners to fly for an extra couple of years instead of sending the airplane to the shop for an overhaul. The Advanced Turboprop will also, unlike its competitors, feature full digital engine and prop control, akin to FADEC, an advance, Mottier said, would allow pilots to “enjoy jet-like operational smoothness in the cockpit,” something that seems to resonate with Mottier, who is himself a pilot. GE is calling the control system Integrated Propulsion Control (IPC). Unlike on a turbofan, on a engine with a prop, the calculus an engine control unit must perform for automatically setting and adjusting safe power output has to take into account the effect of the prop on the whole proposition. GE seems confident in creating this ambitious technology. GE plans to run the engine for the first time in two years as part of what GE says is a $400 million investment in the program, which some have called “an all-out assault” on Pratt & Whitney’s market dominance in the segment. It’s hard, upon hearing that description, not to imagine a large-cabin pressurized single that’s fast enough and with Cessna’s highly regarded maintenance network behind it. If the lower acquisition cost is substantially lower, it will be a major player immediately. Couple that with the lower operating costs promised by GE thanks to the Advanced Turboprop’s great fuel efficiency, and you have a strong value proposition coming out the gate. The GE turbine looks great. When will it be available (certified?)? on p. 48 of the current P&P (with the new 2-door Mooney on the cover). Neither the developmental hybrid nor the airplane it pulls were described in the text. Pls fill in the details of the plane and motor — by email or in the next P&P issue.